Zoeller Company is now offering Building Information Modeling (BIM) files for engineers, architects, designers and contractors who use BIM for their projects. We are building out an extensive library of 3-dimensional product renderings, complete with all necessary technical data, which can be opened with Autodesk Revit. Take a look! 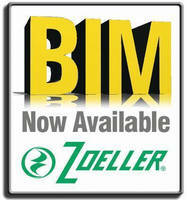 Our BIM Library is located under the Support tab on our zoellerpumps.com and zoellerengprod.com sites. If you need a drawing that is not listed, let us know. We can usually have it for you within a short period. For more information, call our product support team at 1-800-928-7867. DC Sump Pump is specifically built as backup solution. Fractional Horsepower Grinder Pump efficiently processes waste.